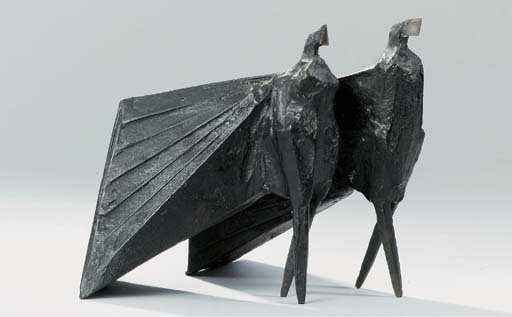 D. Farr and E. Chadwick, Lynn Chadwick Sculptor, Oxford, 1990, no. 764S, p. 292, another cast illustrated. Chadwick's cloaked figures of the 1970s were entirely independent creations, made without reference to anything that was happening in sculpture at the time. E. Lucie-Smith comments, 'A further aspect is that they are inherently dramatic. It is easy to think of Pair of Cloaked Figures II as performers upon a stage. The pair of sculptures is very small, at just over six inches high. Their postures, leaning very slightly forward as they stride, and the massive garments streaming behind them as if blown by a high wind, make them seem much larger when they are seen out of context, as in a photographic reproduction' (see E. Lucie-Smith, Chadwick, Stroud, 1977, p. 108).